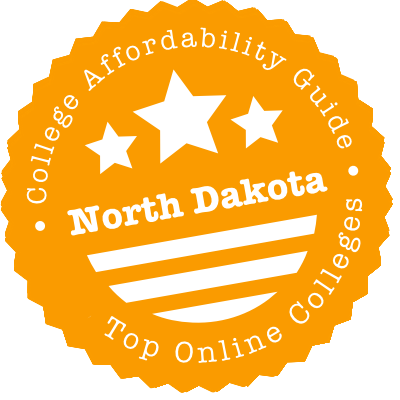 Scroll down to see the top not-for-profit colleges and universities in North Dakota offering online degree programs. The University of North Dakota offers a wide range of fully online degrees at the bachelor's, master's, and doctoral level. Students interested in earning an engineering degree can go through the entire program completely online to earn a bachelor's degree in chemical, civil, electrical, mechanical or petroleum engineering. Students may enter the engineering program in the fall, spring, or summer semester and typically take at least six years to complete the program of semester-based classes. These accredited engineering programs use recorded lectures. UND also offers online undergraduate degrees in general studies, communication, psychology, social science, social work, and an RN to B.S.N. program. Master's degrees are offered in applied economics, aviation, business administration, forensic psychology, medical laboratory science, nutrition, public administration, public health, social work, and space studies. The university also grants online master's degrees in five nursing tracks and seven education specialties, and it has online doctoral programs in nursing. Depending upon the program, students might be required to take part in live web-based classes or to attend a few meetings on campus. Many of the programs do not charge an out-of-state tuition fee, and online programs are eligible for financial aid. Bismarck State University has about 20 online programs for students who want to earn an Associate in Applied Science degree. Several of the programs are for students who want to work in the energy sector. Options include electric power technology, nuclear power technology, and petroleum production technology. The college also has a Bachelor of Applied Science in Energy Management that students can earn online. Business degrees available online include associate degrees in management and business administration. Students who want a job in the technology sector can earn associate degrees in fields such as geographic information systems, information processing, and computer support. North Dakota State College of Science has more than a dozen associate degree and certificate programs that can be completed through online coursework. Many of these are Associate of Applied Science degrees to help student acquire job skills in fields such as retail management, paramedic technology, or health information technician. The college also has a program that allows students to customize their course of study to meet their manufacturing career goals while pursuing a certificate, diploma, or Associate of Applied Science in Technical Studies. Students who want to transfer to a four-year school can pursue a general liberal arts or general studies transfer degree. The college has transfer agreements with universities in North Dakota, Minnesota, and Montana. Minot State University has been offering online degrees for about two decades, and it now has nine undergraduate degrees, three graduate degrees, and an array of certificates and minors that can be completed entirely online. Undergrad options include four majors in business fields, an RN to BSN degree-completion program, and a general studies degree. Master's programs include information systems, management, and special education. A master's in sports management started in 2018. Most classes are delivered asynchronously, so students can attend at any time, but a few require real-time video-conferencing. If Minot State doesn't have a required class available online, students can register in a comparable online class offered by another North Dakota school under a collaborative program. North Dakota State University offers an online program leading to a bachelor's degree in university studies, which allows a student to tailor the program to his or her particular needs that are not currently met by an existing degree program at NDSU. Other online options for undergraduates are bachelor's degrees in sociology, strategic communication, or human development and family science, a program that gives students the option of majoring in adult development and aging, child and adolescent development, or family science. Graduate students interested in an online degree can earn a master's offered by NDSU or one offered by the Great Plans Interactive Distance Education Alliance, or Great Plains IDEA, a consortium of 11 universities. NDSU students enroll in all the Great Plains IDEA classes through the university and earn their degree from NDSU but take online classes taught by faculty from any consortium member. NDSU offers online master's in construction management; health, nutrition and exercise science; software engineering; and transportation and urban systems. Great Plans IDEA offers online master's degrees in community development, dietetics, human development and family science, family and consumer sciences education, and merchandising. Valley City State College offers several completely online degrees. These include bachelor's degrees in business education, business process integration management, career and technical education, English education, history education, professional communication, and technology education. VCSU also offers an online Bachelor of Arts or Bachelor of Science in music that allows students to take academic coursework for the degree online. However, music students are required to take music lessons and ensembles at VCSU or some other college or university for credit and transfer those credits to VCSU. Music applicants must submit an audition before being accepted into the program. VCSU also offers online graduate degrees in education. The Master of Arts in Teaching is designed for students who earned a non-teaching degree as an undergraduate and who want to transition to a teaching career. The Master of Education program has concentrations in library and information technologies, technology education, teaching and technology, elementary education, English education, and teaching English language learners. Scholarships are available for both master's programs. Maysville State University recognizes students turn to online classes for their convenience and ease of access. To that end, MSU Online offers everything from general education classes for students who just want to knock out some required credits to full bachelor's programs. And students who already have a bachelor's degree and want to change careers can enter MSU's online Master of Arts in Teaching program and gain teaching credentials while still holding a job. Bachelor's programs available online include business, education, and nursing. Most classes are completely asynchronous, meaning students can access content when it suits their schedule, but a few programs include sessions when students must participate in live, online classes at a scheduled time. The University of Mary Online Center offers four online undergraduate programs in business with concentration in Accounting, Human Resources, Management, and Marketing. There are also online degree programs in liberal arts and organizational leadership. The university has 15 online graduate degrees, including an M.S. in Strategic Leadership, a Master of Project Management and an M.S. in Counseling. Their online MBA degree can be earned in as little as 18 months and offers five specialization areas: accountancy, healthcare, executive, energy management, and human resources management. Dickinson State University offers several online bachelor's degrees and associate degrees. Most of the programs are in the field of business. Online Bachelor of Science degrees are available in business administration, finance, human resource management, or accounting, which offers a corporate track and a professional track. Students who have earned an Associate of Applied Science degree can earn a Bachelor of Applied Science. Students with some college credits can enter the Bachelor of University Studies program online, which allows students to plan their own program of study. DSU also has online programs leading to an Associate of Science in Agricultural Sales/Service with a focus on equine management or equine training. Students who hope to complete a four-year degree can begin by earning an Associate in Arts degree online. The college also offers a 16-credit Human Resource Management Certificate that is open to students with junior status or higher who have taken an accounting course. Online classes follow the same semester calendar that on-campus classes follow. DSU online students have access to technical help and online tutoring assistance, and they are assigned a contact person to handle general questions. North Dakota features a solid selection of online courses and degrees for postsecondary learners. We’ll take you on a quick tour of the state’s online course catalog, explain how to take online classes at any public college in the state, and cover easy credit transfer methods. In case you’re not satisfied, we’ll also explain how to get cheaper tuition at online schools across state lines. Then, we’ll break down the state’s top performer and notify you of schools with accreditation troubles. Finally, we’ll sum it all up with a list of web resources to get you one step closer to your online degree. Here’s the dilemma. You’re enrolled at one school, but you want to take a class at another. Although this could be a hassle in many states, it’s no problem in North Dakota. That’s because the colleges comprising the North Dakota University System (NDUS) allow students registered at one college to painlessly take classes at other NDUS schools. No extra enrollment necessary. The University System collaborative process was expressly designed to enhance students’ distance education options. Students can enroll for collaborative status through their home institution. For the uninitiated, NDUS is made up of five community colleges — Bismarck State College, Dakota College at Bottineau, Lake Region State College, North Dakota State College of Science, and Williston State College — and six universities — Dickinson State University, Mayville State University, Minot State University, North Dakota State University, University of North Dakota, and Valley City State University. Thanks to the permeability of the North Dakota University System, it may behoove you to enroll in an inexpensive associate degree program at one of its community colleges and then transfer to a four-year university. Since they’re all part of the NDUS, it’s a fairly straightforward process. For one thing, the system uses common course numbers, so English 101 at one college is, you guessed it, English 101 at another. Moreover, the state’s tribal colleges and private universities have also adopted common course numbers. NDUS and the tribal colleges have also teamed up to create the General Education Requirements Transfer Agreement (GERTA). Look up your college in the GERTA guide to see which courses automatically count as general education when transferring to another school. North Dakota maintains several reciprocity agreements. The first is the Minnesota-North Dakota Tuition Reciprocity Program. North Dakota students may enroll in approved programs at Minnesota public colleges (or vice versa) at a lower rate. On a larger scale, North Dakota’s membership in the Midwest Student Exchange Program (MSEP) means that ND residents will pay no more than 150% of the cost of in-state tuition at participating colleges in eight other Midwestern states. On a still larger scale, North Dakota also participates in several exchange programs through the Western Interstate Commission for Higher Education (WICHE). The Western Undergraduate Exchange guarantees that North Dakotans pursuing an undergraduate degree will pay no more than 150% of the in-state rate at eligible schools in 14 Western states. Thanks to the Western Regional Graduate Program, graduate students pay the same rate as residents but only in specific programs, most of which are classroom-based rather than online. We put all the colleges in North Dakota through our affordability algorithm, and three schools rose above the rest to meet our standards for quality, flexibility and cost. Check out College Scorecard to see how they compare to other Dakota colleges in terms of graduation rates, debt load and financial aid distribution. DSU Online runs certificate, associate and bachelor’s programs. Although it’s a state-run university, Dickinson charges nonresidents the same rate as North Dakotan for online courses. (Read the fine print.) That’s a big bonus for nonresidents looking for an affordable entry point into the state’s higher education system. Learn about how financial aid in the form of scholarships, grants and loans can lower the price further. NDSU’s Distance & Continuing Education has the full scoop on its online & hybrid programs. You might even want to speed up your degree by taking online courses through summer school. Students enrolled in NDSU campus programs and high schoolers aiming for early entry or dual credit are also welcome to take online classes. When it comes to tuition & fees, online students are billed at residency rates; check out the Financial Aid & Scholarships section for advice on funding. Interested in human sciences or agriculture? NDSU has a fabulous deal! The school is a member of the Great Plains Interactive Distance Education Alliance (Great Plains IDEA), a consortium of 19 public universities that have banded together to offer cool multi-institution graduate programs. Online courses are taught by experienced faculty from many schools, but there’s always one common price per credit hour and no out-of-state fees or distance delivery fees. At UND’s Online & Distance Education arm, you’ll find full descriptions of online degrees and online courses, including doctorates! Details on admissions criteria and tuition are listed on each degree page. In many standard programs, online students pay in-state tuition, regardless of residency. Funding & scholarship questions can be directed toward the Student Financial Aid Office. Curious about the university’s distance learning reputation? UND is doing just fine—especially in business. In U.S. News & Report rankings for UND online programs, the university is often in the Top 40 of Best Online MBA and Best Online Graduate Business Programs (Excluding MBA). Rankings for its graduate engineering, graduate education and bachelor’s programs are also very respectable. The Higher Learning Commission (HLC) accredits nearly every degree-granting institution in North Dakota. See its list of North Dakota institutions on its website. Students at HLC-accredited schools are eligible for federal financial aid and can often transfer credits between institutions. From HLC’s website, click on any “Public Disclosure Notices” to see if the Commission has taken a negative action against a school. A notice is equivalent to a warning and can usually be cleared up easily; probation means the school is out of compliance with Commission standards; and show-cause means HLC is threatening to drop the school’s accreditation. HLC placed the tribal college, which makes online courses available to its students, on probation in 2015 due to “concerns related to program review, general education, assessment of student learning, persistence and completion, and planning.” HLC will determine in 2017 whether the college has adequately addressed the areas of noncompliance. It remains fully accredited while on probation. Formerly known as Fort Berthold Community College, Nueta Hidatsa Sahnish is a tribal college offering online courses to its students. As of 2016, the Department of Education had placed the school on “heightened cash monitoring 2” (HCM2), a status that leaves it unable to distribute financial aid to students in the normal manner. Under HCM2, schools are reimbursed for grants and loans they distribute, which may negatively affect the school’s cash flow. However, HLC appeared less concerned; in 2016, it actually removed the college from notice. Higher Learning Commission (HLC): The Higher Learning Commission is the regional accrediting body for North Dakota colleges and universities. All community colleges, state universities and tribal colleges — and most private institutions — choose HLC accreditation. Midwest Student Exchange Program (MSEP): North Dakotans qualify for reduced tuition in traditional and online programs at participating colleges across the Midwest. The same holds true for Illinois, Indiana, Kansas, Michigan, Minnesota, Missouri, Nebraska and Wisconsin residents coming to North Dakota. North Dakota University System (NDUS): Learn how to enroll as as a collaborative student and take distance ed courses across the state higher education system. The NDUS website also features plenty of useful information about transferability of credits. Finally, if you’re aching to go to college in Minnesota, the NDUS website shows you how to receive a lower rate through the Minnesota-North Dakota Tuition Reciprocity Program. Western Interstate Commission for Higher Education (WICHE): Although they’re not specific to distance ed students, WICHE’s two tuition reciprocity programs — the Western Undergraduate Exchange and the Western Regional Graduate Program — allow North Dakotans to reduce the price of out-of-state degrees in member states. Residents of Alaska, Arizona, California, Colorado, Hawaii, Idaho, Montana, Nevada, New Mexico, Oregon, South Dakota, Utah, Washington and Wyoming get the same deal if they attend a participating college in North Dakota. North Dakota Center for Distance Education: Want an early start? Find online courses for sixth through 12th graders, including Advanced Placement courses. Any student in or out of the state can register for classes, but they are not free. North Dakota University System CampusConnection: Search for distance ed courses across NDUS schools. Select an online format under “Mode of Instruction,” then narrow your options to a specific school, term, subject and/or course style.